Kitsap PFLAG: Moving Equality Forward in Kitsap County: Ref. 71 likely on Ballot in November - Vote YES! Ref. 71 likely on Ballot in November - Vote YES! The Secretary of State for Washington has announced that the people behind putting Ref. 71 on the ballot in Washington State have enough signatures (barely) to qualify the Referendum for the ballot. One of the most important messages for us to get out is that a vote of YES will keep the expanded domestic partnership benefits/responsibilities that were passed by the Washington State legislature. 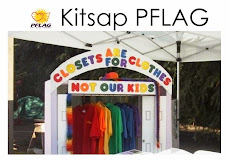 Kitsap PFLAG will be helping to get out accurate information about Ref. 71 for folks in Kitsap County. Watch this blog for information about upcoming events. Meanwhile, are you registered to vote? I am an alumnus of NKHS (1992) and I would love to give any help, pointers, or guidance to any LGBTQI youth who needs it.